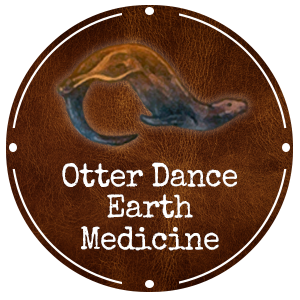 Completion of the year long course of Shamanic Studies is required to apply for certification as an Otter Dance Earth Medicine Practitioner. Applications will be reviewed on an individual basis and requires an interview with Robbie to be considered. The Practitioner requirements can be completed simultaneously and at the pace of the individual applicant. Robbie is a modern day Medicine Woman and a traditional Shaman who serves as a intermediary between this world and the spirit world, she holds ceremonies, rituals and healing with the aid of Spirit Guides following the cultural traditions passed down through generations. Robbie is the Vision Keeper and Chief of the Fire Dance, a medicine dance given to her by the Ancestors. Her spiritual path has its roots in Native American tradition but has developed through Robbie’s experience into a practice she calls Earth Medicine. The emphasis of Earth Medicine is reverence and respect for all living beings, conscious connection to Spirit and a keen awareness of the lessons life has to offer. Her journey along this path has given her many opportunities to work with some amazing spiritual teachers as well as other visionaries. She was given the Medicine name Otter Woman Standing by her Ancestors and Spirit Guides as she works within the other realms. She has also worked extensively in the Medicine-Dance community, both here in the U.S. and also overseas, traveling to many sacred sites around the world and working closely with powerful Medicine-People from many cultures and spiritual paths. Robbie has tremendous creative energy and a sincere desire to seek cooperative partnerships and to build living communities of spiritual thinkers. She has a talent for using her inspiration and vision to uplift those around her. Robbie takes great pleasure in exploring the richness of all possibilities and wants everyone to live life to the fullest. She shares her experience and her vision to spread positive energy and she believes deeply that everyone has this power. Want to learn more about becoming an Otter Dance Practitioner? Please contact us by clicking here.